How do you like my new blogger template's layout? Well, we don't have that many choices anyway, so will make do with this layout for a while. Actually I quite like the background but I wish it's a three column template. Yes! It can be done. This is continuation of my wire wrap sparkly crystal ring piece. This is not a tutorial but just a modified version of the ring into a pair of earrings. I was not really sure if I can use the same technique to create the earrings but I did it. A very nice compliment to the ring I must say. What do you think? 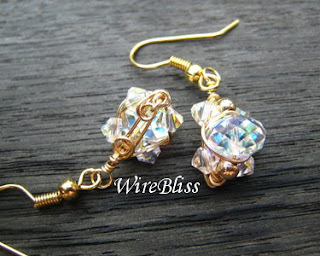 If you are interested, you can check out my tutorial for the wire wrap sparkly crystal ring. 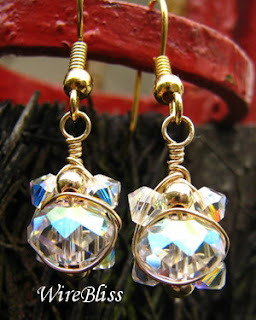 Same techniques to make this pair of earrings.